Who knew you could mow a lawn like this? Nice TV spot from BBDO and nice of them to use my dulcets. I might want one of these. Director James Kent seems to be on a roll at the moment. MotherFatherSon with Richard Gere is one of the most compelling things on TV and here's one of the trailers I voiced recently for his romantic post-war movie The Aftermath with Keira Knightley, which is also well worth catching. Nice work by the team at Create UK for Fox Searchlight. Great to work with actor Roger Allam last week who was at the studio to record an Introduction to Buddhism, no less. We actually had a lot of fun so I'm not quite sure why we both look so miserable (though I’m probably wondering how I ended up with the greyer beard of the two). He is between series of ITV’s Endeavour and about to appear at the National Theatre in Rutherford and Sons. Great fun at the weekend narrating an orchestral concert with the fab West London Sinfonia and conductor Philip Hesketh as part of the 2019 Ealing Music & Film Festival. 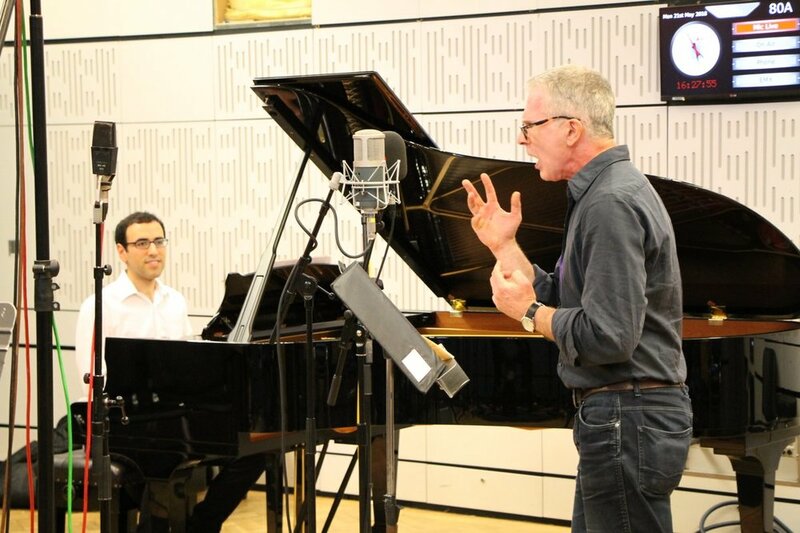 The Composer is Dead is a kind of musical whodunnit with a brilliant musical setting by US composer Nathaniel Stooky of Lemony Snicket’s book of the same name. The composer is dead so the Inspector is called in to the find the murderer (or murderers) among the instruments of the orchestra…with much ensuing hilarity. We had a blast! Claire Foy as you've never seen her before... This was a helluva movie and hyper cool trailer campaign from the team at AV Squad. Pleased to have voiced these. And while we’re on the subject of Christmas, here’s a reprise of a fun Santa item we put together a couple of years ago (with apologies for the old boy’s fruity language!). Now here are some good Christmas gift ideas. Any of these will do thanks, Santa. Very nice web spot from the clever people at Domu Brands and a nice campaign to work on. With all that's happening on the US-Mexico border at present this brilliant sequel to the original Benicio del Toro vehicle suddenly seems even more topical. It's hard-hitting stuff. Pleased to voice these. Loving the look and feel of this new film for Volvo we've just completed. Very happy to be on this one, especially with such a beautiful sound track from old friends Ljudbyran in Gothenburg. Both visuals and music have a touch of sci-fi classic Interstellar about them (than which there is no higher praise in this house). 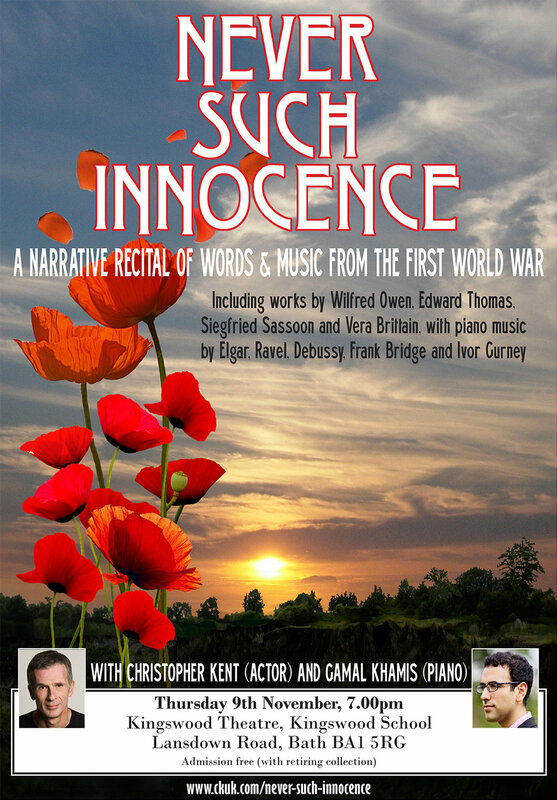 Looking forward to performances of Never Such Innocence this week at Kingswood School, Bath on Thursday November 9th at 4.30pm & 7pm (tickets via schoolsecretary@kingswood.bath.sch.uk) and Clapham Chamber Concerts on Friday November 10th at 7.30pm. Looking forward to performing Myth, Hope and Tragedy at All Saints' Church, Church Street, Isleworth, TW7 6BE, a programme of words and music to commemorate the centenary of the Russian Revolution. I'll be reading historical and literary accounts, plus poetry by Yevtushenko, alongside the music of Shostakovich, Prokoviev and Scriabin played by Simon Trentham (cello), Yoriko Gibbs (piano) and Yoriko Wakabayashi (piano). Admission free (with retiring collection). They're all fantastic musicians so do come along if you're around. Should be a fun evening. Enjoyed voicing trailer campaign for surprise breakout hit Goodbye Christopher Robin with the good people at Create UK, quite a thoughtful and touching film with more subtlety than you'd guess from some of its press. This one is apparently showing pre-match in Premier League stadiums, but since I've never managed to get a ticket I'm hard pressed to know. Nice campaign though from the guys & gals at Blackbook London. Well I must admit this one was a bit of a departure for the actor whose own kids claimed to be scared when he read them bedtime stories (sorry girls). But even the voice that brought you The Woman in Black, Spooks, The King's Speech and countless other heavy hitting dramas dramas can't help but soften up for the nation's favourite little piggy. This is the trailer campaign currently airing for Peppa Pig the Movie, very nicely done by the team at Create UK. More stellar work from the guys at Fox Soccer USA, with some stylish promos for their UEFA League coverage. This one is from ace LA producer Luke Van Kampen and as always I was very honoured to voice it.